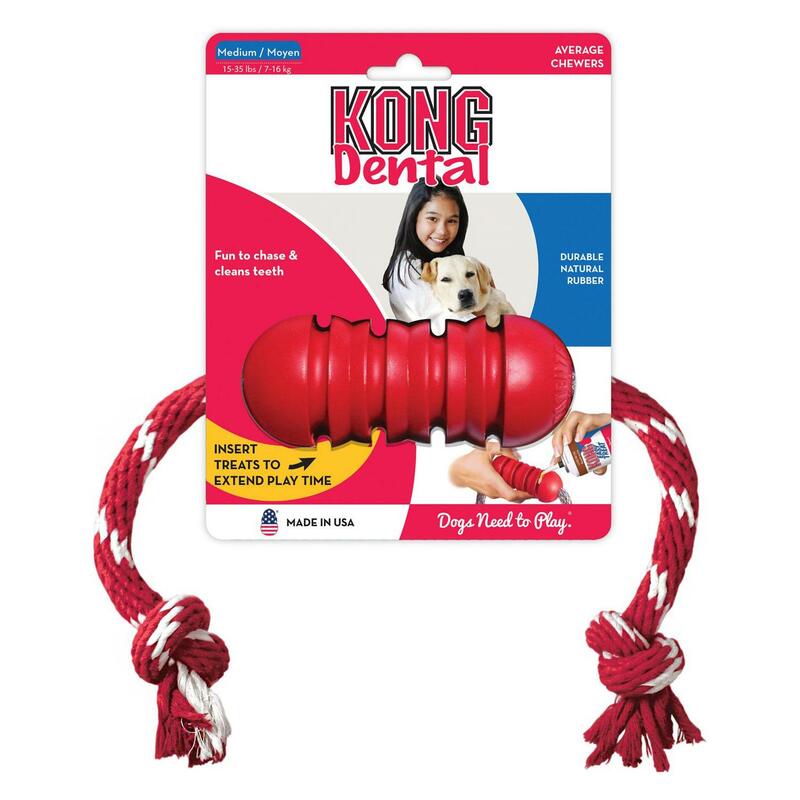 For a fun twist on the classic KONG toy, your pup will love our Dental KONG Dog Toy with Rope! Made with patented chew-clean grooves, the Dental KONG® With Rope dog toy effectively cleans teeth and gums as pets chew and play. Made of rubber and high-quality floss rope, this Kong toy is durable and will provide hours of fun for pets. Add dog toothpaste, KONG® Easy Treat dog paste (sold separately) or peanut butter inside the grooves to entice dogs to chew. The tough yet gentle rubber rubs your dog's teeth clean as they chew. The rope acts as dental floss for a clean doggy smile. Durable, thick, 100% natural, puncture-resistant KONG rubber toys give dogs a satisfying chewing workout. Toys bounce unpredictably when thrown and float on water to provide plenty of fun anywhere dogs like to play. 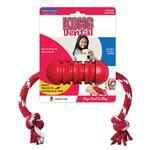 The attached throw rope allows this Dental KONG toy to be used for tugging or to be tossed longer distances. The sliding feature of the rubber portion over the rope adds interest. Like all KONG toys, chewing and playing helps clean teeth and gums while keeping your dog busy with nondestructive entertainment. Posted On 05/05/17 by Julia H from Beaverton, OR Yes, Julia H recommends this product! The 2 poodles of mine enjoy playing this toy rope together by pulling at 2 ends. It is lovely to see them playing together. And this is quite a sturdy toy. Posted On 02/14/16 by Sandra L from Holiday, FL Yes, Sandra L recommends this product! Posted On 08/08/15 by celia from grand isle, VT Yes, celia recommends this product! My dog loves this tug toy. Great for his teeth too. Posted On 07/24/15 by FurKidMom from PDX, OR Yes, FurKidMom recommends this product! This is currently my 13 week old BSDs favorite chew toy. He throws it in the air, chases it, and chews to his heart's content . Posted On 11/07/13 by Anna B from Anchorage, AK Yes, Anna B recommends this product! The dogs love to fight over this one-so the treats don't last long. Bandit loves his sweater. He is an older dog, so he gets chilled easy. The cozy warm sweater is easy to put on, which I like.